The Golden Triangle is an alternative route off the Sierra Crest hiking down to and through Yosemite Valley as part of our backpacking the Sierra Crest Trails from Tahoe to Whitney. Call it a significant detour off our Crestline route. The Golden Triangle alternative route takes us down to Yosemite Valley following the JMT route. We'll hike a different route back up to the Sierra Crest through Central Yosemite to resume the John Muir Trail in Lyell Canyon 5.6 miles South of Tuolumne Meadows. We'll hike the John Muir Trail "backwards" down off the Sierra Crestline to the Valley for a couple of days of camping in Camp 4, or maybe hang out with some of the employees. We'll mingle with the crowds of touristas, meet some of the cool employees of DNC, some cool Yosemite National Park employees, and of course meet as many of the backpackers and climbers who gather here every Summer from every part of the world as possible. Departing the Valley to return to the Sierra Crest brings us back through Happy Isles to follow the JMT for 4 steep miles climbing up to Little Yosemite. From Little Yosemite Valley we break off the route of the JMT hiking up the Merced River to Merced Lake. From Merced Lake we access the trails over Vogelsang Pass. From Voglesang High Sierra Camp we can either intercept the Southbound JMT in Lyell Canyon 5.6 miles South of Tuolumne Meadows or hike through Tuolumne Pass directly to Tuolumne Meadows. My tentative figure for the distance from Tuolumne Meadows to Yosemite Valley and back to the JMT in Lyell Canyon via Voglesang Pass is 49.2 miles. This figure is obtained using the 27.3 miles figure given for the distance to Tuolumne Meadows on the Happy Isles trail sign, rather than using the 20.9 miles given by the trail sign along the JMT behind the TM visitor center. 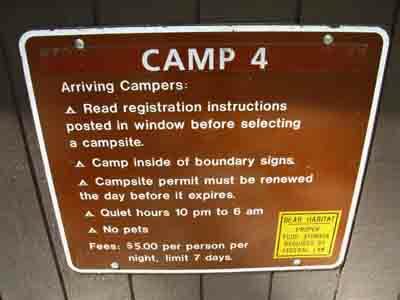 We add that 27.3 miles to the 27.5 miles to Yosemite Valley cited by the trail sign at the Lyell Canyon Trailhead to obtain the total trailhead to trailhead distance of The Golden Triangle route departing and returning to Tuolumne Meadows via Yosemite Valley at 54.8 miles. 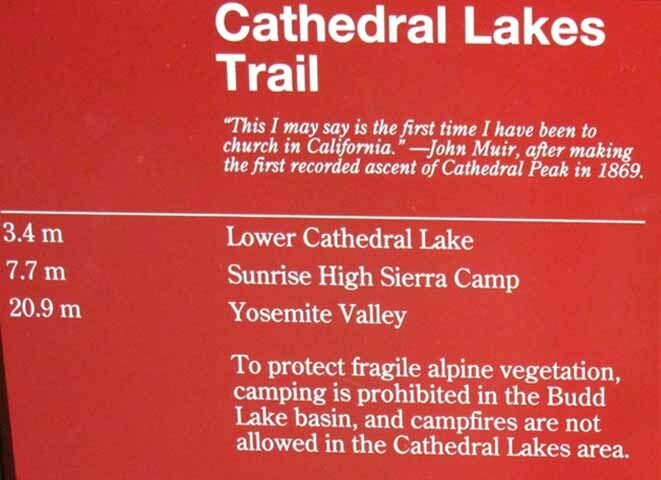 We reduce this by the 5.6 miles from the Lyell Canyon Trailhead to where the trail down from Voglesang High Sierra Camp intersects with the John Muir Trail. This means that The Golden Triangle adds 49.2 miles to the distance of our Tahoe to Whitney backpacking trip. As we build the guide South we will reconcile the various differing miles figures cited on different trail sign posts along the same trail. John Muir Trailhead sign at the Wilderness Boundary in Tuolumne Meadows. Note that the distance to Tuolumne cited on the trail sign at Happy Isles is 27.3 miles. 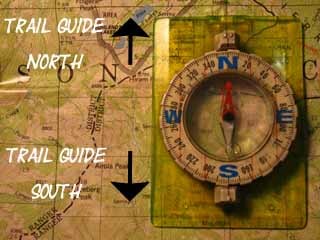 This is the guide index page for one leg of an amazing alternative route off of our typically High Sierra Crestline route hiking South from Lake Tahoe to Mount Whitney. Though our standard route from Tahoe to Whitney walks the majority of the John Muir Trail on our way down the Sierra Crestline to Mount Whitney, we miss the beginning of the JMT climbing out of Yosemite Valley. In fact, our basic PCT-JMT route along the Sierra Crestline from Tahoe to Whitney stays up high and goes around the whole Merced Drainage far above and away from Yosemite Valley. We can fix that "slight" omission by adding the "Golden Triangle" to our Tahoe to Whitney backpacking trip. This is the index page for the first of two the legs of trail composing The Golden Triangle. This first section of the Golden Triangle starts out by hiking from Tuolumne Meadows down to Yosemite Valley "backwards" down the John Muir Trail. The next section brings us up from Yosemite Valley back to the John Muir Trail in Lyell Canyon by a different route than the JMT we hiked down. The shape of our route roughly relates to a triangle. As Yosemite is the Gold Standard of High Sierra beauty, I call this route "The Golden Triangle." Our return hike will begin through Happy Isles with the JMT, but we will turn off the JMT at Little Yosemite to find our way back to the Southbound JMT in Lyell Canyon via Merced Lake and over Voglesang Pass. Our hiking map of Tuolumne Meadows shows the beginning of the JMT "Golden Triangle" route down towards Yosemite Valley and the end of our Golden Triangle route over Voglesang Pass. The Golden Triangle ends where we reengage the Southbound JMT in Lyell Canyon just South of Tuolumne Meadows to continue our Southbound hike on the JMT to the Whitney Portal. This index handles the hike "backwards" down the JMT from Tuolumne Meadows to Yosemite Valley. The next index page South covers the second leg of The Golden Triangle, the hike from The Valley to the JMT in Lyell Canyon via the Merced River and Voglesang High Sierra Camp. This is a great backpacking trip around the heart of Yosemite on its own. If we add the hike across the North Yosemite Backcountry from Highway 108 to the Golden Triangle, it is a fantastic tour of the Northern and Central parts of Yosemite National Park. If we add the hike over Donohue Pass down to Reds Meadow, our hike covers the majority of the Yosemite Wilderness and walks across the center of the Ansel Adams Wilderness to its South. I really enjoy The Golden Triangle as a rather unique section along my Tahoe to Whitney hikes. An Alternative Route for long distance High Sierra Backpackers up and down the Sierra Crestline to further explore Yosemite National Park.